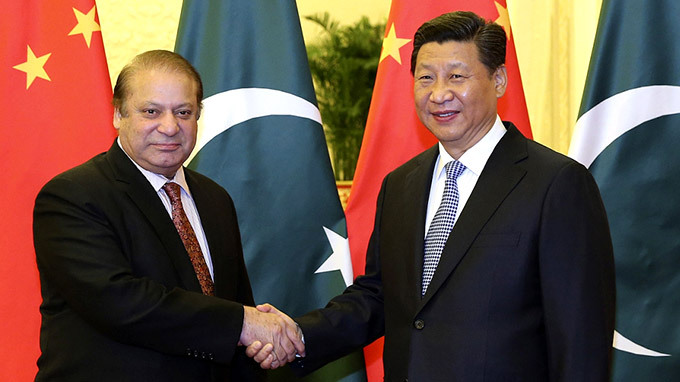 Pakistan’s Prime Minister Nawaz Sharif shakes hands with China’s President Xi Jinping. Photo: Xinhua. China’s president Xi Jinping arrived in Islamabad on Monday 20 April for talks with Pakistani president Nawaz Sharif, to address parliament and make clear to the world a very obvious power shift from West to East. Xi Jinping has agreed a ‘superhighway’ investment for Pakistan valued at $46 billion which represents three times the total foreign direct investment achieved by the country during the course of the past seven years. The United States has spent $31 billion in Pakistan since 2002. The 3000 km network of roads, railways and pipelines will run from Gwadar on the Arabian Sea to Kahgan in the Xinjian region of China via Pakistan administered Kashmir. This highly ambitious programme will help China further control key maritime trade routes, massively extend its influence in central and south Asia and perhaps bring an economic miracle to Pakistan – putting an end to the insufferable power outages now experienced throughout the country (this latter improvement was promised by Mr Sharif during the 2013 election campaign). There are, of course, major worries over Pakistan’s ability to absorb investment of this magnitude given political fears, official corruption, calls for separatism, criminality and Islamic militancy. As ever, New Delhi focuses intently on developments in the country and low-income Pakistanis remain unconvinced that they will be significant beneficiaries of all this largesse. A superhighway that runs many long miles through interesting country during interesting times. As the writer suggests there may be troubles ahead but those responsible will need to do more than face the music and dance.